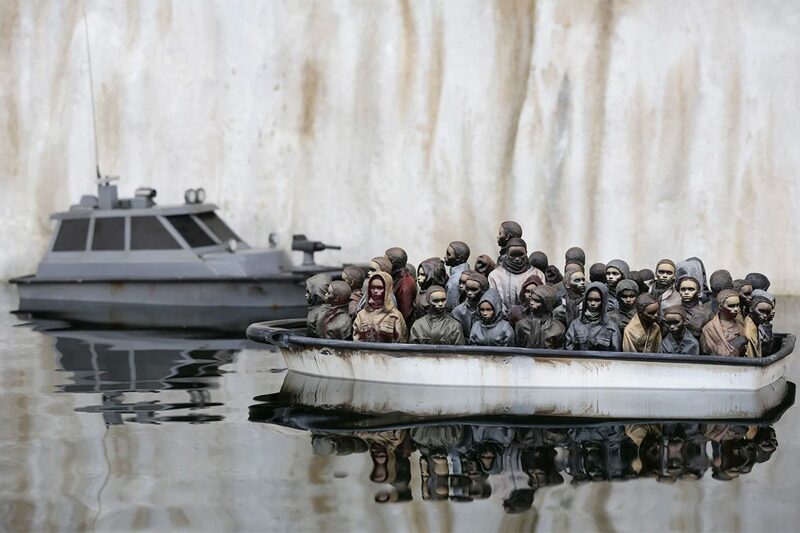 Everyone now has a chance to get a priceless Banksy artwork for only £2 (approximately $2.55) – the renowned anonymous artist, in collaboration with Choose Love store, is raffling one of the refugee boats from his temporary theme park Dismaland. All you need to do is guess the weight of the boat more precisely than others and make a minimum donation on the Choose Love’s website. All money donated goes directly to supporting refugees and displaced people. 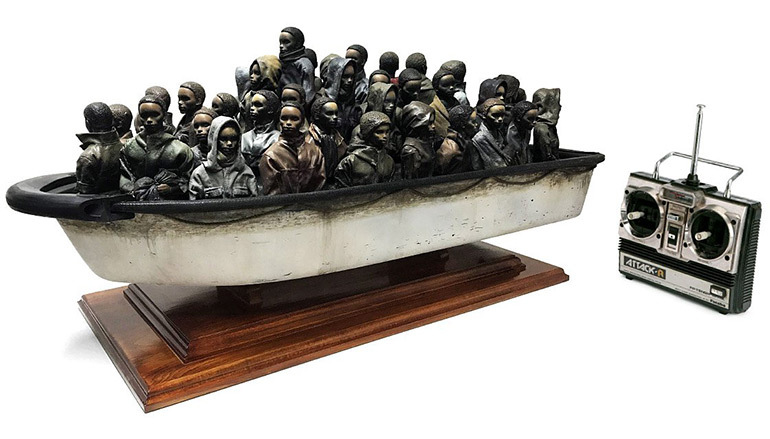 The 90cm (35in) long sculpture depicts an overcrowded boat with migrants. Banksy said that the boat is fully remote controlled and has a top speed of about three knots. 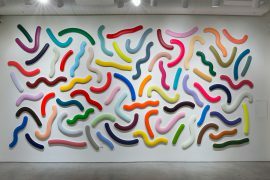 It is constructed from a shop bought fiberglass hull customized with quick-cast resin figures which are foam filled and hand spray painted. 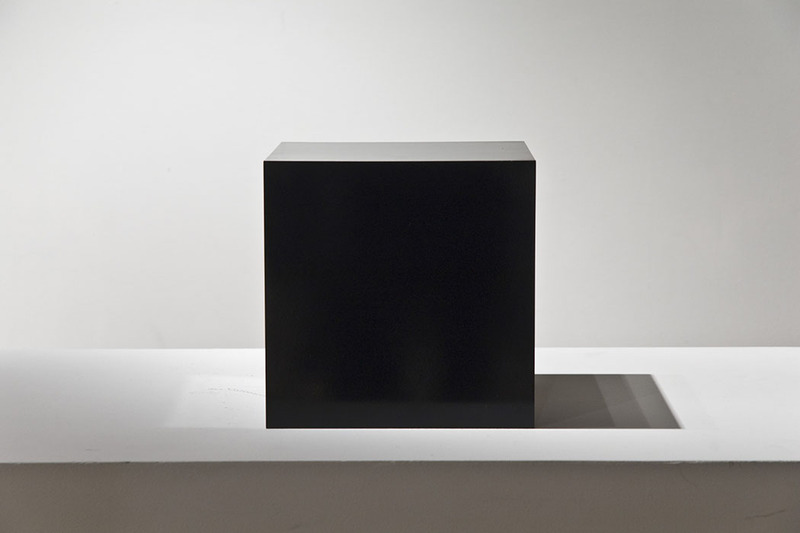 The sculpture is on display all this month in Choose Love’s pop-up store at 30-32 Fouberts Place, Carnaby Street, London. Following Choose Love, your guess should be to the nearest gram (for example a guess of about 5 kilos could be 4800g). You can even specify milligrams if you’re feeling confident. Closest guess wins the boat (the wooden plinth is not included in the weight guessing). The competition closes 8pm GMT December 22nd, 2018. At which time the boat will be weighed by specialist students from Kings College London, and the winner will be notified by email. So if you want to win this exclusive Banksy sculpture, go on this page and try to guess the boat’s weight (and, of course, make a donation). Good luck, guys! UPDATE: The Banksy boat raffle is over. The weight of the boat is 11,692.2 grams. Congratulations to the lucky winner who guessed within 0.49 grams!